SonomaCountyGolf.com’s 1st Annual Chip in For Charity Golf Tournament, Sonoma County CA. InnoVision is proud to be a main sponsor at SonomaCountyGolf.com’s first annual golf tournament in Petaluma, CA. SonomaCountyGolf.com’s recently re-launched their new website, a complete guide to local Sonoma County golf courses and people involved in the local golf industry. To celebrate the re-launch of SonomaCountyGolf.com, they are hosting their 1st Annual Chip in For Charity Golf Tournament. Proceeds are benefiting the Polly Klaas Foundation. A great local charity that has dedicated its mission over the last 20 years to the education of child safety. Over that time they have assisted over 9,000 families locate their missing children. They have built strong relationships with law enforcement & their volunteers to help with their mission. 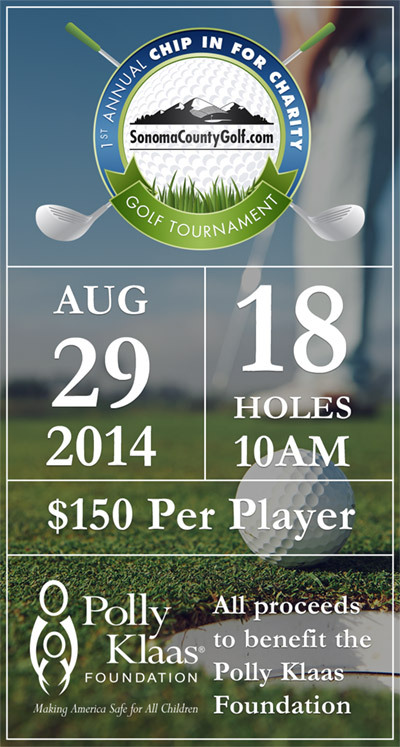 This years tournament will held on August 29th at Rooster Run Golf Course in Petaluma, CA. The shotgun start will begin at 10am and is open to the public. Food and refreshments will be provided on the course along with a cocktail hour following to announce winners of the tournament and raffle prizes. « SEO – Is Link Building Dead?